"Let the avenue to this house be rendered difficult and gloomy by mountains and morasses. Let the doors be of iron, and let the grating, occasioned by opening and shutting them, be increased by an echo that shall deeply pierce the soul." From the catwalk atop the central rotunda at the Eastern State Penitentiary in Philadelphia, you can see the entire eleven acres of the abandoned facility. Every building on the site, which operated for 142 years and held the likes of Al Capone and Willie Sutton, is crumbling. Trees are growing through the roofs of many of the buildings, every piece of metal on the property seems to be rusting, and every piece of plaster is crumbling. It's hard to imagine that at one time this prison was the largest and most expensive building in America. It drew visitors from around the world to review its penal system and architecture, both of which influenced prisons worldwide for the next century. The prison sits on a rise in the middle of the Fairmount section of Philadelphia, and from the catwalk you can see the skyscrapers of Center City. When it was constructed, Eastern State was on a farm more than a mile outside the city limits. The first inmate was brought to Eastern State on October 23, 1829. His name was Charles Williams, and he was 18 years old. His prison record states: "Burglar. Farmer by trade. Can read. Theft included one twenty-dollar watch, one three-dollar gold seal, one gold key. Sentenced to two years confinement." He would've gotten a good look at the tall, foreboding exterior of the unfinished prison as he approached in a locked carriage. It was and still is a gloomy fortress with tall iron gates and castle towers. The exterior walls are 30 feet high and 12 feet thick at the base. Mr. Williams must've felt a bit nauseous realizing that this monstrosity was built for the sole purpose of straightening out the likes of him. The Quakers were the moving force behind construction of the prison, and they wrote that the exterior appearance should be "a cheerless blank indicative of the misery which awaits the unhappy being who enters." During the previous thirty-five years, the reform-minded Quakers tirelessly lobbied the Pennsylvania legislature to build a prison based on the idea of reform through solitude and reflection. The Quakers hopefully and naively assumed that an inmate's conscience, given enough time alone, would make him penitent (hence the new word, 'penitentiary'). They wanted a new prison to prove their theory, and in 1822 the Pennsylvania legislature approved the funding. A revolutionary radial design by a young architect named John Haviland was chosen. Each cellblock was to radiate in different directions from the hub. This allowed easy view of every cellblock from the center. After Charles Williams was brought through the three sets of giant doors, he was met by the warden. He must've felt like a head of state. That feeling wouldn't last long. Williams was assigned a number, prisoner number 1, which would be his new name during his entire stay. Before he was taken to his cell, a black hood was placed over his head. The hood was used whenever inmates were outside their cells so they could not see any other inmates. Williams was then placed in a cell with nothing to do--no work, no reading materials, nothing. The Quakers knew what would happen: "His mind can only operate on itself; generally, but a few hours elapse before he petitions for something to do, and for a bible. No instance has occurred, in which such a petition has been delayed beyond a day or two." It's safe to assume that Charles Williams sincerely regretted stealing those gold trinkets before those first few days were up, and he probably came to know the stories in that bible very well during the next two years. The inmates were not allowed to communicate with each other or meet for any purpose, not even for religious services. Ministers sermonized to the inmates while walking through the prison, their voices echoing through the cellblocks. The inmates weren't allowed to sing, whistle, have visitors, see a newspaper, or hear from any source about the outside world. They were allowed in their exercise yards, which were attached to their 8 by 12 foot cells, just one hour per day. At Eastern State, you went into your cell and you stayed there. You saw no one except a guard, and you spoke to no one. Here's how the Quakers explained this policy: "No prisoner is seen by another after he enters the wall. When the years of confinement have passed, his old associates in crime will be scattered over the earth, or in the grave and the prisoner can go forth into a new and industrious life, where his previous misdeeds are unknown." The cells were damp and musty with very little air circulation. The original sewer system didn't work properly so the cells reeked. The central heating system, another new idea at the time, didn't work very well either. Although the Quakers banned flogging at the prison, other types of corporal punishment were used. If you were caught communicating with another inmate by, say, tapping on a pipe, you might be denied a few meals or secluded in a dark empty cell for a day or two. If your infraction was more serious, you were chained to a cell wall or denied a blanket in winter. One prisoner was kept in a dark cell in irons for 42 days. When a counselor discovered the delirious inmate and gave him some bread and water, the counselor was fired. The "shower bath" was another punishment used at the prison. An inmate was stripped to the waist, chained to an outside wall in cold weather, and doused with cold water. If it was cold enough outside, ice would form on the inmate's body. Even crueler was the "iron gag." This was a five-inch piece of metal that fit over the inmate's tongue. The inmate was also cuffed with his wrists behind him, and a chain was connected from the gag to the cuffs. If the inmate fought the device and pulled with his arms, the gag was forced deeper into his mouth. At least one inmate died from the iron gag. Although the conditions and punishments at Eastern State were harsh, they probably weren't harsher than other prisons of that time. The medical attention and the food were superior to prisons that came before Eastern State, and it was generally free of the corruption and danger associated with older prisons. The inmates were also expected to work, and those who didn't have a trade were trained in one. By the time Eastern State was completed in 1836, it was the most expensive building in America at a cost of $772,600. It immediately became a popular attraction, being visited by sightseers and dignitaries from around the world. By mid-century the prison was being toured by 10,000 people per year. During the next 100 years, approximately 300 prisons worldwide were modeled after Eastern State's radial design. But Eastern State was criticized relentlessly for the use total solitary confinement. The London Times claimed that it was "maniac-making." Charles Dickens visited the Eastern State Penitentiary in 1842 and later wrote about it. "The System is rigid, strict and hopeless ... and I believe it to be cruel and wrong.... I hold this slow and daily tampering with the mysteries of the brain, to be immeasurably worse than any torture of the body." There are no figures on how many people went insane at Eastern State. Prison officials persistently claimed that solitary confinement had no ill effects on the inmates. Cases of mental illness were frequently attributed to "excessive masturbation." One inmate lost his mind and died within a few months of incarceration. The prison physician concluded that the inmate "though apparently well on admission, was strongly predisposed to mania." Through the 19th century, problems of mental illness and overcrowding forced Eastern State officials to dilute and eventually abandon the idea of complete isolation. The black masks were thrown out in 1903, and by then the iron gags were long gone. 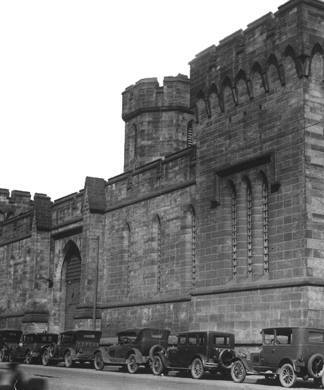 In the 20th century, Eastern State Penitentiary was just an old, crowded prison. 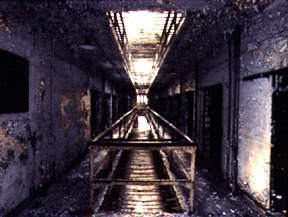 Like other prisons, it had its share of brutality, riots, hunger strikes, escapes, suicides, and scandals. Things got interesting in 1929 when Al Capone spent eight months at Eastern State on a weapons charge. Capone allegedly needed a place to hide out from the IRS. As the legend goes, he was friendly with the warden, outfitted the prison band with instruments and uniforms, and quelled a riot. A 1929 newspaper article described Capone's cell: "The whole room was suffused in the glow of a desk lamp which stood on a polished desk.... On the once-grim walls of the penal chamber hung tasteful paintings, and the strains of a waltz were being emitted by a powerful cabinet radio receiver of handsome design and fine finish." Eastern State was in the news again in 1945 when Willie Sutton, an infamous bank robber, and eleven other inmates escaped through a tunnel to Fairmount Avenue. The tunnel was equipped with supports, fans, and lights and took at least a year to build. The inmates scattered in all directions, but they were all captured, most within a few hours. Prison plaster worker Clarence Klinedinst designed and built most of the tunnel. At the time of the escape, he had only two years left to serve. Klinedinst had ten years added to his sentence for the escape. 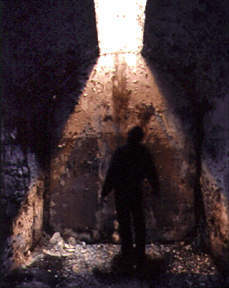 Tunnels weren't unusual at Eastern State. In fact, they were the favored means of escape. Renovations in the 1930s uncovered an estimated 30 incomplete inmate-dug tunnels. Eastern State was closed in 1971. By then it had been certified as a National Historic Landmark. Several schemes surfaced during the next twenty years for converting it into a shopping center or condos, but every plan was fought by a hearty band of local preservationists. They eventually convinced then-Mayor Wilson Goode of the site's historic value, and he put an end to conversion plans. A few years ago the Pennsylvania Prison Society, the direct descendant of the Quaker reform organizations, was given use of the site for historic tours. 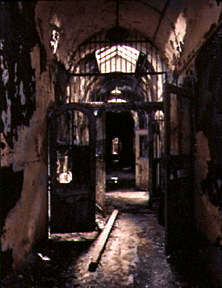 The prison has since become an extremely popular tourist attraction. The site has also been used for several art installations and performances, and the Prison Society has acquired grant money to repair the roofs of numerous buildings. While touring Eastern State, it's easy to imagine yourself being incarcerated there 150 years ago. The cell walls are high and arched, like a church. The only sunlight comes from a small skylight. The geometry of the room invites you to stare up at the light and lift your prayers and beseechments to the Lord. The lonliness and tedium envelopes you in dread. Through peepholes the guards could be watching you at any time. They are a silent force always there to correct you if you stray from the course, always willing to punish you if need be. Here you are hardly human, just a number in a solitary cell. You have nightmares about the iron gag, the black hood, and water freezing shut your eyes, ears, and nostrils. You learn to believe in God and you pray to Him for salvation because otherwise you will go nuts. The belief that you are communicating with an all-powerful, all-merciful being and the faith that He is even the slightest bit concerned with a wretch like yourself is some consolation. Maybe that keeps the heebie-jeebies at bay another day or two. And when you have finished giving up a chunk of your life, you will be cleansed and reformed, and you will go forth sinning no more because you never, ever want to be led into that giant stone house on the hill again, the place where it took every ounce of strength to keep from going stark raving mad. Color photos © Graydon Wood. Used by permission.